My husband Lulu is addicted to anything with puff pastry dough. Because of the horrible windy weather, I decided to prepare my version of (vegetarian) chicken soup for the soul in the form of individual mushroom and mozzarella tartlets accompanied by a bowl of warm corn chowder. It’s the perfect prescription for this cold, gray day. 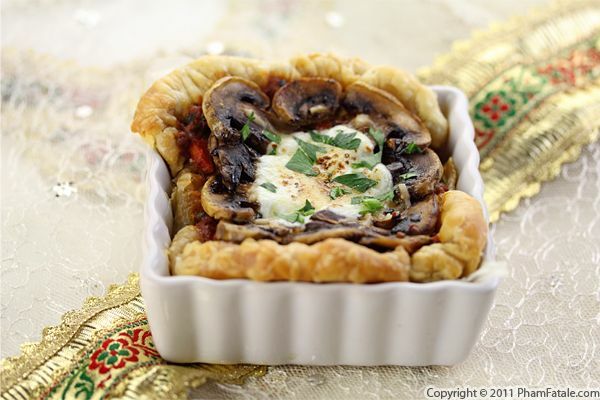 This savory tartlet consists of 4 layers. First, I baked the puff pastry shells separately in the oven. I cooked the first layer of soy chorizo along with tomato paste and tomato sauce (you could also add ground beef for extra flavor if you don’t need it to be vegetarian). The second is sautéed large button mushrooms in butter and the last one is thick mozzarella slices. The result is spectacular and is really enhanced pairing it with corn soup and garlic cheese bread. You won't be disappointed! Mướp tàu hũ xào (loofah squash and tofu stir-fry) is a standard in Vietnamese vegetarian cuisine. 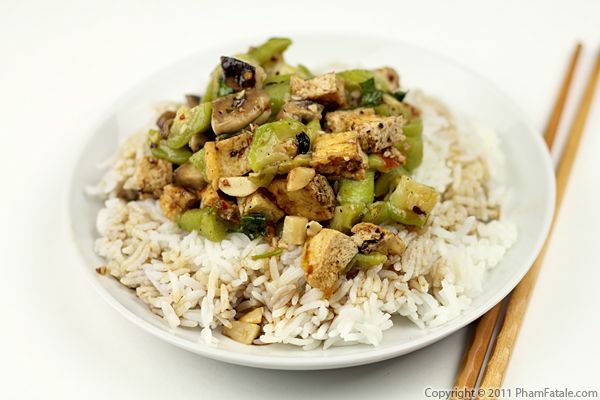 Mướp (Vietnamese Loofah) is stir-fried along with tofu in black bean sauce and chili garlic sauce. The dish is seasoned with soy sauce and fried garlic. I also added straw mushrooms as a foil to the loofah. It's a very quick and easy dish I often make when I'm in a rush and I want a tasty, healthy meal. Vietnamese loofah is a very common vegetable in Vietnam that is also used a lot in making canh ("soup" in Vietnamese) because of its natural sweetness and tender texture. You won't be disappointed by this, and if you like it, it’s easy to put together non-vegetarian versions. Making savory tarts doesn't require a specific recipe. The basic dish consists of a puff pastry shell filled with your favorite mixture and topped with vegetables. I had Baby Bella mushrooms on hand, so I made a version using them along with an artichoke pesto. The pesto is a combination of artichoke hearts, lemon, garlic, pine nuts and olive oil. To soften the pesto, I added mascarpone cheese. I topped the tart with the Baby Bella mushrooms and roasted red bell peppers. Cheddar cheese was the finishing touch so the filling formed one piece. 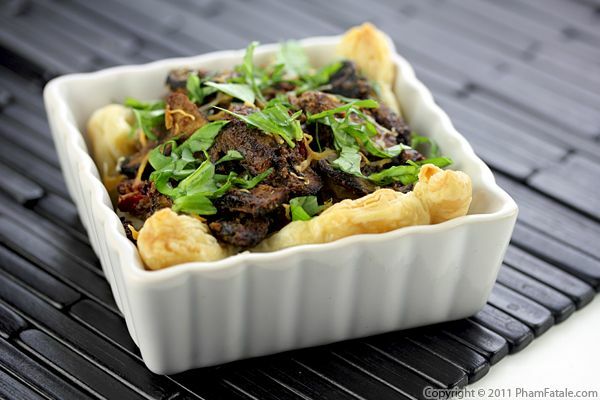 This eggplant side dish is very easy to prepare. It's perfect if you want to cook Asian food for a vegetarian crowd. 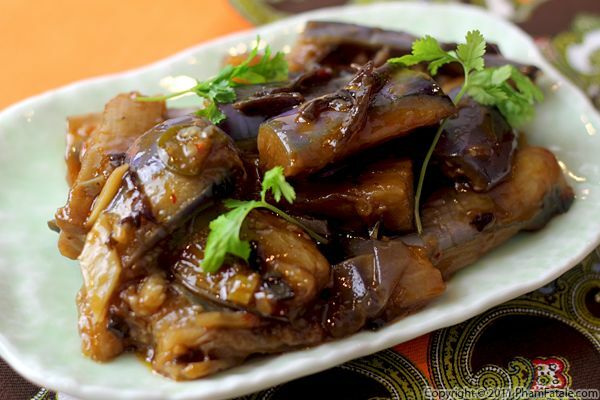 I sautéed Japanese eggplants in a hoisin sauce-based mixture for its caramel color and subtle sweetness. To this, I added several crunchy ingredients such as shredded bamboo and black fungus mushrooms (called nấm mèo in Vietnamese) to balance the soft texture of the eggplant. 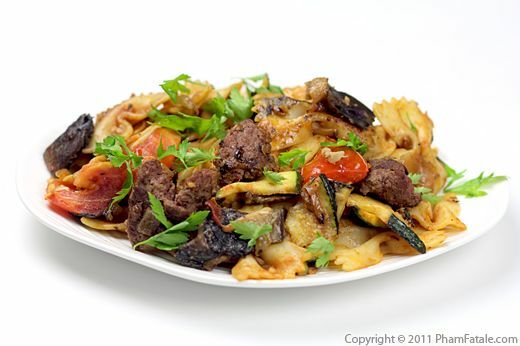 It's important to add spiciness to the dish as the eggplant can be a little bland. I added sliced jalapenos, grated ginger and store-bought chile garlic sauce. The result is a combination of sweet, garlicky, spicy and savory. Making delicious pasta is fairly easy; however it requires a few little tricks to ensure that the dish always turns beautifully. The pasta sauce is one of the key components. Today, I used ground beef, fresh ripe tomatoes, grilled zucchini, eggplant, Portobello mushrooms, a sprinkle of Parmesan cheese and fresh oregano. I bound all the ingredients together using pasta water. This pasta dish is unpretentious, tasty and oh so simple.